Argentina was the only South American country with a complete rail network. It had been mostly British-built and most of the British investment in South America went to Argentina. In 1857 the first railway in the Buenos Aires region was inaugurated, the Buenos Aires al Oeste with 5ft 6in broad gauge. The Central Argentino of 1870 linked the river harbor Rosario with Cordoba on 5ft 6in gauge. Only in 1886 Buenos Aires was connected with Rosario and the crack train became the Rosario Express from Buenos Aires Retiro station. In 1891 the broad gauge was extended to Tucuman. In 1938 started South America's first luxurious "Pullman" day train, the blue/silver El Cordobes Buenos Aires - Rosario - Cordoba. After WWII the nice British PSII Pacifics hauled the Porteno express Buenos Aires - Cordoba. The Central Cordoba completed a meter gauge line Cordoba - Tucuman in 1876. Under the denomination Central Norte the meter gauge was extended to Quiaca at the border of Bolivia in 1908. Small-wheeled Baldwin Pacifics and on the mountain sections 2-10-2s hauled passenger trains there. The Ferro Carril del Sud was founded in 1862. 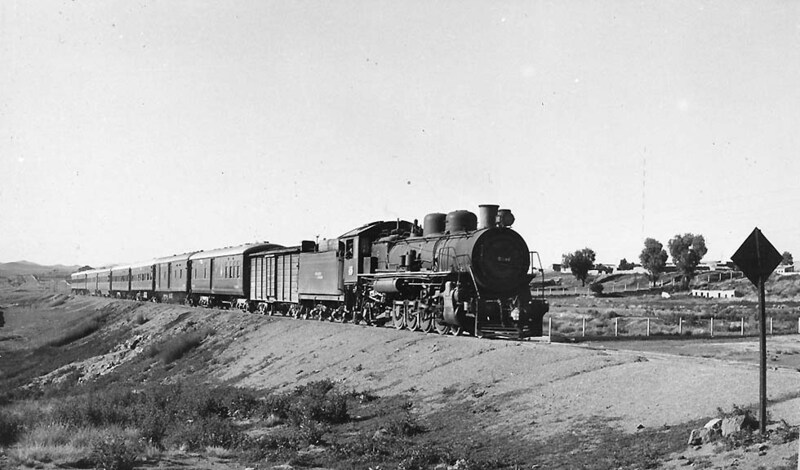 Its 5ft6in broad gauge reached Bahia Blanca in 1891 and Neuquen in 1899. The express from Buenos Aires Plaza Constitucion to Bahia Blanca and Neuquen consisted around 1907 of wooden sleeping-cars, a 1st class saloon, diner, two 2nd class saloons and vans. A direct 5ft6in-broad gauge Ferro Carril Buenos Aires al Pacifico (BAP) reached Villa Mercedes in 1886 under entrepreneur Juan E. Clark. The extension to Mendoza and San Juan was built in 1885 by the Gran Oeste Argentino, then also taken over by Clark. The BAP was the line of El Internacional, which connected at Mendoza with the Transandino to Chile. In 1937 BAP introduced the luxurious day train El Cuyano Buenos Aires - Mendoza - San Juan with a wooden Pullman observation car. The night train Buenos Aires - Mendoza, including sleepers, offered the Chile connection (see next chapter). From 1938 oil-fired Pacifics ran from Buenos Aires over 1200km to San Juan without change of engine! Cook’s timetable showed still in 1980 the twice-weekly Libertador Buenos Aires - Mendoza exclusively with sleeper, parlor car and diner. It had the high reputation of a “Lujo”. The Nord-Este Argentino under J.E. Clark built a standard-gauge network near the borders of Paraguay. On the way to Buenos Aires the Rio Parana had to be crossed until 1978 by the train ferry Ibicuy - Zarate. Posadas was reached in 1910 and later El Internacional from Buenos Aires was ferried to Paraguay. General San Martin, broad gauge Buenos Aires Retiro - Mendoza connecting with the General Belgrano meter-gauge Transandino railway to Chile. American diesel engines and modern cars built under Fiat license in Argentina, first painted dark-green, then dark-blue/red/cream, replaced steam and the old wooden cars. 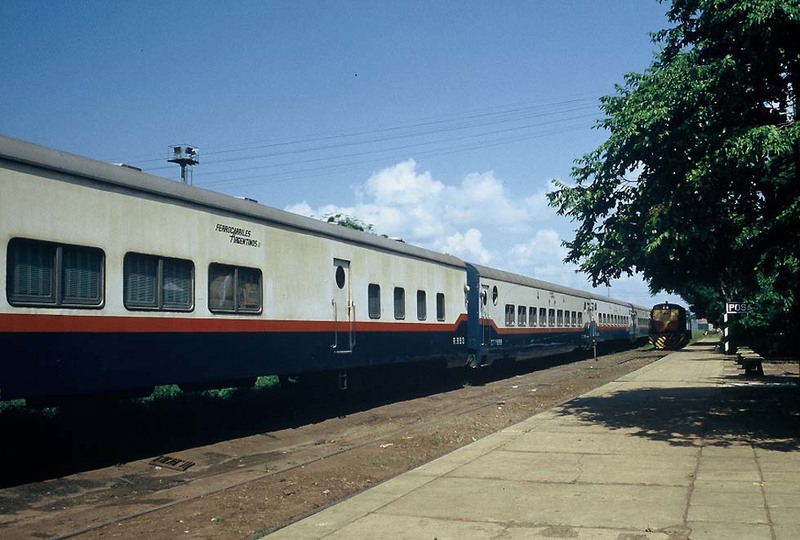 Still in the '80s El Gran Capitan with coaches from Asuncion offered sleeper, diner, Pullman and motorcar transport Posadas - Buenos Aires. El Panamericano, the meter gauge connection with Bolivia, was confined to La Quiaca - Tucuman. At Salta a "mixto" started on the mountain line to Antofagasta, Chile, but it terminated at Socompa. The express from Tucuman to Buenos Aires Retiro was the prestigious Independencia on broad gauge with sleeper, diner, Pullman, cinema car and motorcar transport. Also El Libertador Buenos Aires Retiro - Mendoza offered the same amenities. To the southern tourist resorts ran the Lagos del Sur Buenos Aires - San Carlos de Bariloche and the Estrella del Valle to Zapala, both with sleepers, diner, Pullman and motorcar transporter. Ferrocarriles Argentinos, overstaffed and strictly regulated, caused losses up to 1 percent of the GDP. Preparing for privatization, president Menem ordered to stop all passenger trains except suburban ones in 1993. Expresses much better equipped than European long-distance trains abruptly were withdrawn. The famous Libertador was killed on March 10, 1993. Only the services Buenos Aires Plaza Constitucion - Mar del Plata and later also El Tucumano until 1996 and El Catedral Buenos Aires - San Carlos de Bariloche survived. 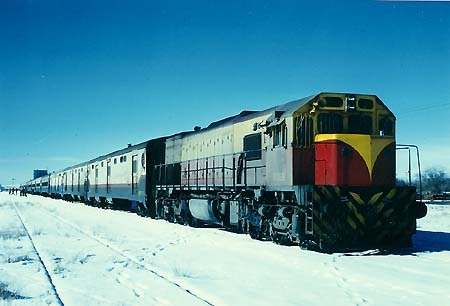 In 1994 SEFEPA bought diesels and cars from Spain and connected Viedma with San Carlos de Bariloche in the south by the Tren Espanol, later the Crucero Terrestre. At Esquel still the 0.75m-gauge La Trochita makes nostalgic tourist trips. 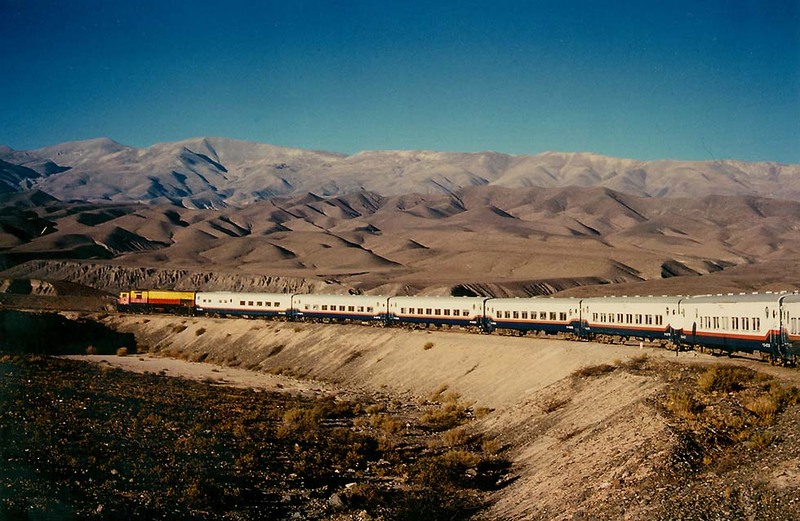 A modern tourist train, El Tren a las Nubes, ascends up to 4475 m altitude in the Andes near Salta. In the new century the Estrella del Norte, including sleeper and diner, appeared on the Tucuman - Buenos Aires broad gauge. Trains from Buenos Aires to Cordoba, to Rosario, to Bahia Blanca and a few other ones had a revival. El Gran Capitan with sleeper, Pullman, diner and motorcar transport, now by TEA, once again connected Posadas with Buenos Aires, but Cook Overseas Timetable noted: “This service is reported as running up to 5 hours late on a regular basis”. And for other trains appeared the warning: “Services may be cancelled at any time due to poor loco availability”. After privatization had ruined the network, the government selected in 2007 the Alstom group as preferred bidder for a future Buenos Aires - Cordoba link to be served by "Cobra" double-deck TGVs. 1870: Broad gauge Rosario - Cordoba, 1886 from Buenos Aires, 1891 extended to Tucuman. connection to Valparaiso and Santiago de Chile. 1993: Almost all passenger trains closed down. Buenos Aires (Retiro) - Rosario, FC Central Argentino (consist according to The Locomotive, Dec. 14, 1918): Pacific engine, 1 brake-van, 1 kitchen car, 1 restaurant car, 2 first-class cars, 1 saloon car (wooden cars, arched roof, 6-wheel bogies, 5ft6in gauge). At Posadas there had been 4 CT, 1 R, 1 P, 1 FP and diesel 6954 (CoCo, GE). The timetable listed also BA (motorcar transporter) and the connecting Internacional from Asuncion, which no longer did run. "La Trochita" and "Tren Patagonico"
The veteran Hitachi Pullmans had been always apreciated by the extraordinary suspensión and the generous distance between seats. Also they have an excellent visual field to apreciate the mountain when crossing the Andes mountains. These coachs have been preserved and restored to its original condition. This classic Fiat coachs are well maintained, and preserved in original conditions, and are the distintion to this trip. In the World only few trains have used cinema coachs. The argentine cinemas had been built with sloping floor, as in the true cinemas. The Tren Patagónico is the last liner train in the World which maintains this type of service. BAGGAGE COACH - This closed vans can transport baggage and cycles. Train status: Preserved in original conditions.